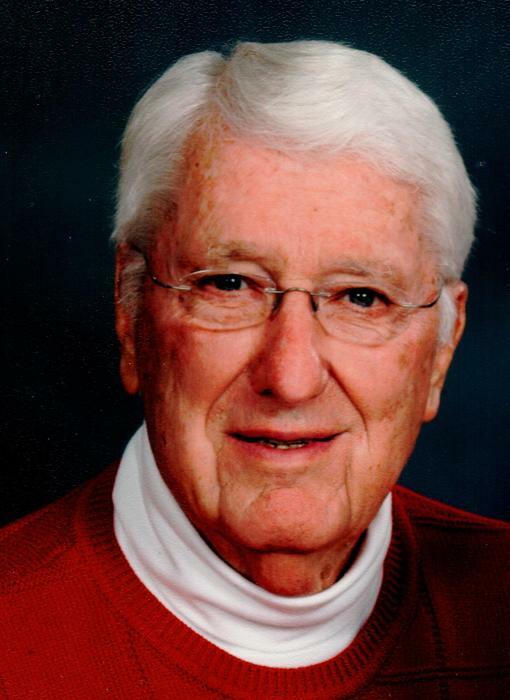 Obituary for Clifford "Cliff" A. Murray | Hartzler-Gutermuth-Inman Funeral Home Inc.
Clifford A. Murray “Cliff” 10.26.28- “Coach” as most knew Cliff fought an extremely tough battle with health issues this past year and passed away peacefully Tuesday, August 14, 2018 at Sprenger Health Care, Mishawaka. He has joyfully joined Jean, his wife in Heaven who he missed so much. Jean had passed away in February 2017. They married December 27, 1953 in Rockville, IN. They had shared a wonderful marriage of 64 years together, rarely were they apart. His father T. Stuart and mother E. Freida Murray along with two brothers Stuart and Richard preceded him in death. Survivors include children: Pamela (Chauncey) Baldwin of Crystal Lake, IL, Janet (Marty) Freeman of Mishawaka, Rebecca Murray of Elkhart, Robert (Monica) Murray of Alpharetta, GA; eight grandchildren and seventeen great grandchildren. Cliff was well known by many in the sports, education and social arena. He was a graduate from Elkhart High School where he was a multiple sports star athlete and went on to Indiana State University to finish his college degree in teaching. While at Indiana State he was a member of the basketball team, winning the National Basketball Title. He was also a member of the first USA Pan American Games Basketball team playing in Buenos Aires, Argentina in 1951 bringing GOLD home for the USA team. Not only was he a key player on the gold medal team but he acted as the team interpreter as he was the only person speaking Spanish. This placed him in a position to meet Eva and Juan Perón the dictator at that time in Argentina. At Indiana State he was selected to the school’s all-decade team for 1950-59. He was also inducted into the Elkhart Sports Hall of Fame. Most of his work and basketball experience was at Concord High School where he was a social studies teacher for 23 years, vice principal for 4 years and principal for 5 years. Cliff coached basketball at Concord for 13 years. Cliff was also the golf coach at Concord. He retired from teaching/coaching in 1989 after 32 years. Some of the most gratifying moments for Coach were when his former students would return to see him. They thanked him for the work ethic and life lessons he had provided that helped to shape their lives. He continued to meet with former students with the latest being a luncheon at Bent Oak this past spring where he was the honored guest. Cliff flourished in retirement as he did in life giving 100% effort to any task he took on. Detail and perfection as his goal “give everything you have until the final second ticks off the clock”. His golf buddies at Bent Oak knew him as a competitive player often playing with younger partners and being very successful. His trophy room is a testament to that! He liked to play during the week so the “younger kids working during the week could have the weekend tee times”. He was always up for a round or two. It was not unusual to get a phone call with “we decided to play an extra 9 holes”. Cliff remained active in many community projects. He was past president of the Elkhart Retired Teachers Association, secretary-treasurer of the Elkhart Breakfast Exchange Club, board member of CAPS, and active on the board of trustees at his church. He supported many charities as well. His hobbies included family, yard work, golf, Cubs/ White Sox baseball, ND spots and travel. He and Jean loved to travel often to winter in the warm sun on Orange Beach, Alabama. They are both together again to begin the promise we all believe in, eternal life ever after with our lord Jesus. The family wishes to thank all the friends, helpers and caregivers that supported Clifford in this past year. The many cards, phone calls, visits, cookies, and carrot cake that continued to come to him were greatly appreciated. The care given by all was so special to him, he spoke of it often. Visitation will be at Hartzler-Gutermuth-Inman Funeral Home on Friday, August 17, 2018 from 2:00 PM – 4:00 PM and 6:00 PM – 8:00 PM. Funeral services will be held on Saturday, August 18, 2018 at 2:00 PM at Hartzler-Gutermuth-Inman Funeral Home with Rev. Mark Mikel officiating. There will be visitation one hour prior to the start of services. Private family burial at Rice Cemetery. Donations may be made to the Indiana State University Men’s Basketball Program www.indstatefoundation.org or to Pet Refuge 4626 S. Burnett Dr., South Bend, IN 46614.